How do I create a camp album? Camp photo albums are created to share camp photos, trail cams, and other miscellaneous photos that you want to share with just camp members. Any deer sighting or trail cam sighting that was used to store movement data will also be stored in the album under the title “Journal”. One recommendation I have is to use the Album feature to share ALL trail cam pictures and use the “Map Trail Cam Sightings feature” should only be used for pictures used to store data. One reason I mention this is that you don’t want to store miscellaneous photos as a sighting because it will be stored as movement and could skew your data. To create an album, click on the Photos tab in the camp. This takes you to the Photo page that displays all your albums. 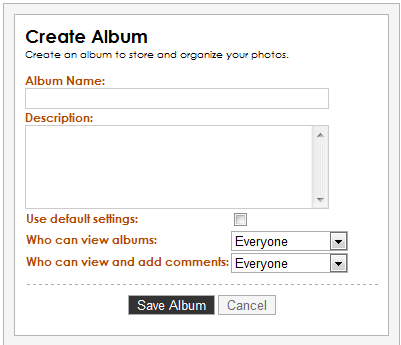 Click on Create Album to start the process of storing pictures. Create album name and add a description. One recommendation I have is to use the trail location and date as a album name if this is storing photos for a trail cam. Ex (Jon’s Stand (10-12-2011). This just makes it easier to keep track of where the pictures came from. Next, use the drop down boxes to give whomever you want, access to these pictures. You can choose everyone or camp members. Click save to continue. On the next screen click Add Files. Browse your computer and choose the files to add. On the next screen click Upload to continue loading or click Add Files to add more. Once you click upload it will go through the process of uploading each file and shows the progress. YOU MUST WAIT until this is done before you navigate to another screen or the pictures will not load. If you have a lot of pictures it may take awhile. When it’s done uploading it will display all the pictures you selected. This gives you a chance to choose an album cover, enter captions, delete photos you didn’t want to add and to make sure it’s going to the right album. See screen shot below. Once you are done editing/viewing you have to scroll down to the bottom and click save. If you navigate to any other screen before clicking save it will NOT save pictures. It will save album and say that you have pictures in it, but they will not appear.